The real kicker though and it just may be another error on Amazon's part; which does happen from time to time. Especially when you catch it and place an order or pre-order before they change it. They can't and/or have never taken back an error if your order is already placed. Take a look at this image of my pre-order, and what I'm talking about is that there is no mention of a promotion on the pre-order listing that I have noticed. I changed my shipping to 1-day, which normally costs $9.98, but there is a -$10.00 promotion being applied and I'm getting that shipping FREE...rofl There is a FREE super-saver shipping on most orders through Amazon, but that only applies to 5-9 business days, not 1 day. You sure this is the best way to order? I was going to look into getiting it with Gamestop or somthing. Amazon has never let me down, and then little things like this are awesome to catch...rofl! I wonder if they will have a collectors edition. I hope not..my wife would try and be the first to order it. I prefer Amazon myself. Gamestops idea of next day is with in a week. They burn me every time I order next day. I always have to call them any time I get a product that is supposed to have some sort of code or offer for ordering with them. As Khalus said, use Amazon. The 49.99 you pay right now is to actually buy the game. No deposit or anything. 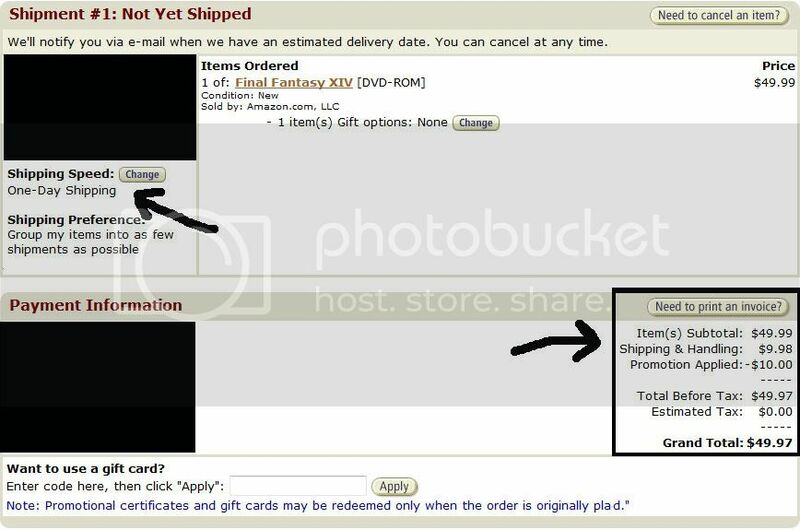 Once the game releases, they ship it to your door. All you are doing is paying for the game NOW instead of later. Don't you have the option to pay now? Thought I did one time on a pre-order awhile back. Dunno...have only ever paid when it was avail to ship! I think that is a policy of Amazon, "don't charge for an item that is not in-stock" yet. From my previous amazon preorder experience they charge when it ships. I don't recall a prepay option. Could be wrong though. I wonder if they will have a collectors edition. If they do then I'll purchase that version instead, but for now I'm content with this one and the free 1-day shipping I was able to get...hehe However, if its a CE like a lot of other MMO have done over the past few years where you get different items based on where you pre-order...yeah I find that to be stupid, so it'll depend on what else would come with it. If it had the soundtrack which I doubt, cause SE knows they can make million more on that alone later on, I'd consider it. Or maybe a world map would be neat, not paper, or even a making of DVD or art-book would be nice. Considering how Square-Enix has never jumped on the band-wagon and ruined their MMO like so many others have or made it easy-mode I doubt they'd follow suit with stupid CE items.